The high spatio-temporal variability of convective clouds has considerable effects on the impact that these clouds have on the atmospheric radiation. Shallow cloud fields reflect the incoming sunlight. Observed from space, they appear white. In addition, they emit thermal radiation at relatively high temperatures. In total, this leads to the effect, that more radiative energy leaves the atmosphere than entering it in regions with shallow clouds – thus the global climate is cooled by shallow clouds. But convective clouds are fragmented, frequently have a complex spatial structure and are changing constantly, which makes it hard to accurately determine the actual radiative effect of these clouds. Because of this, the spatio-temporal variability of cloud fields is investigated at TROPOS. Observations of the geostationary Meteosat satellites enable to estimate the spatial structure of convective cloud fields as well as their temporal change. By tracking cloud structures, their typical life time can be inferred (cf. Fig. 1 and Bley et al., 2016), which influences the development of the cloud coverage and the cloud radiative effect. Fig.1: This figure shows the temporal evolution of shallow, convective cloud fields within two hours. The visible and near-infrared observations of the Meteosat SEVIRI instrument have been composed into a pseudo-colour image (from Bley et al., 2016). Deep convective clouds, which develop into thunderstorms especially on hot summer days, are impressive, but also dangerous phenomena of the continental weather. An increased scientific understanding of the formation and the growth process of these clouds is the necessary foundation for the forecast and warning of these severe weather events with a high social relevance. Moreover the influence of humans on the characteristics of deep convective clouds remains not well understood. Because of this the life cycle of showers and thunderstorms is investigated in close collaborations with the German Weather Service at TROPOS (e.g. projects: HErZ, INCITES). Additionally to gridded radar data and lightning detections, observations of the geostationary Meteosat satellites are available over Germany. From a combination of these remote sensing data (cf. e.g. Fig. 2), one can see where thunderstorms are initiating, how they grow and which kind of hazards they can bring (Senf et al., 2015, 2017b; Wapler et al., 2015). As their properties and their appearance can change within short time, thunderstorms are hard to track. To tackle this problem, we work on methods to detect and track clouds together with international partners (Météo France, University of Oxford, University of Huntsville, Alabama). Fig.2: Here a 75-minute sequence of a thunderstorm development is show. Radar and satellite data with a temporal frequency of five minutes have been combined with each other. The fast-growing cumuliform clouds are forming heavy precipitation and rapidly growing ice anvils (from Senf et al., 2017a). The tropical latitudes, heated by the irradiation of the sun, form a particularly weather active region. Along a relatively narrow belt, which encompasses the whole globe, giant cloud towers are rising, merging into huge cloud clusters and bringing large amounts of precipitation. Mechanisms, which lead to the observed spatial arrangement of tropical clouds and to their organisation, are topic of current research and are investigated at TROPOS with the help of satellite observations and simulation data. In the tropical Atlantic Ocean, another exciting component comes into play: dessert dust, which is transported from the source regions in the Sahara dessert over the ocean, can interact with the tropical cloud systems (cf. Fig. 3). The dusty air can modify the glaciation within the clouds, as the dust particles function as ice condensation nuclei. But the dessert air is also hot and dry, so that possibly also negative effects occur and cloud growths can be inhibited or clouds vanish completely. This interplay is investigated as well using the combination of satellite observations and numerical simulation data at TROPOS. Fig.3: A dust plume extends from the sahara over the Atlantic ocean (from ECMWF MACC simulations). There, dusty air interacts with marine, deep cumuliform clouds as illustrated by cold cloud areas from Meteosat observations (from Lemme, 2018). Weather situations, in which cumulus clouds are growing into thunderstorms, are a very particular challenge for numerical weather forecast. The impacts, such as hail or heavy rain, often are only of short duration and limited in spacial occurrence, so that small errors in the forecast of the start or the position of the thunderstorms have a significant impact. To understand the quality of current and future thunderstorm forecasts, methods for the evaluation of numerical weather simulations are investigated at TROPOS. A modern method is the object-based analysis: observations from the geostationary Meteosat satellites are condensed into thunderstorm cells and their observed properties are compared to their simulated counterpart (cf. Fig. 4 and Rempel et al., 2017, Senf et al., 2017a). Fig.4: As an example, here a thunderstorm situation over Germany is show, using observed infrared temperatures (Meteosat SEVIRI). 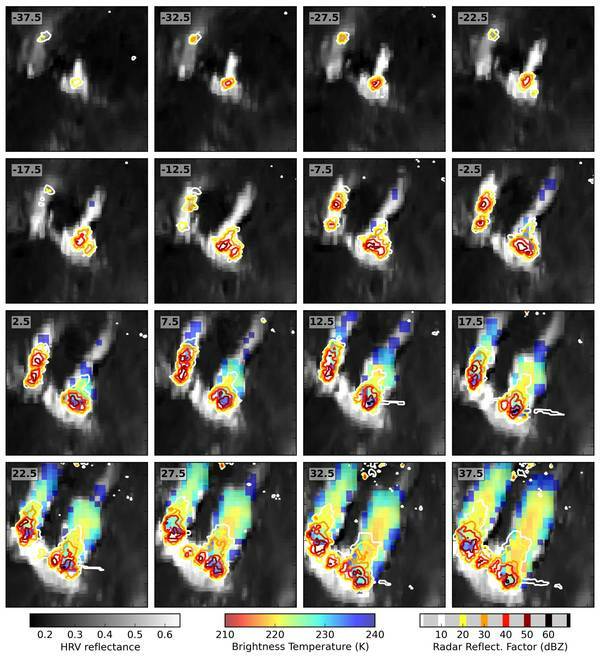 Object-based methods have been applied to derive thunderstorm cells and their properties (from Rempel et al., 2017). Cumulus clouds are also puzzling climate scientists. In conventional climate projections, the typical grid cell size is that large, that even the giant cloud towers of the tropics can not be represented explicitly. Current research works are testing a new generation of climate models with very fine grid resolutions. Modern, object-based methods to evaluate models are developed further for this task and applied to simulations and satellite observations of tropical cloud systems (cf. e.g. Senf et al., 2018). Additionally, it is important to better understand the radiative effect of shallow cloud fields and their representation in model simulations. As convective clouds usually have to be parametrised in atmospheric models, observation data are necessary to quantify their variability and the model uncertainty. At TROPOS, evaluations are performed using Meteosat observations together with high-resolution model results of ICON-LEM. Different metrics are developed, to quantify variability and model uncertainty. With some of these approaches caution is needed: many quantities, as e.g. the spatio-temporal scales of the cloud fields are sensitive to the spatial resolution of the observations and simulations. It could be shown that even simulations with a grid spacing of 156 m overestimate the size of small convective clouds and even better spatial resolution would be necessary to resolve cloud effects below the 1 km scale (Bley et al., 2017; Heinze er al., 2017). Bley, S., Deneke, H. and Senf, F. (2016): Meteosat-Based Characterization of the Spatio-Temporal Evolution of Warm Convective Cloud Fields over Central Europe, J. Appl. Meteor. Climatol., 55, 2181-2195. Bley, S., H. Deneke, F. Senf, and L. Schenk (2017), Metrics for the evaluation of warm convective cloud fields in a large eddy simulation with Meteosat images, Quart. J. Roy. Meteor. Soc., 143(705), 2050–2060. Heinze, R., and Coauthors, (2017): Large-eddy simulations over Germany using ICON: A comprehensive evaluation. Quart. J. Roy. Meteor. Soc., 143, 69–100. Rempel, M., F. Senf, and H. Deneke (2017), Object-based metrics for forecast verification of convective development with geostationary satellite data, Mon. Wea. Rev., 145(8), 3161–3178. Senf, F. and Deneke, H. (2017a): Uncertainties in synthetic Meteosat SEVIRI infrared brightness temperatures in the presence of cirrus clouds and implications for evaluation of cloud microphysics, Atmos.Res., 183, 113-129. Senf, F. and Deneke, H., (2017b): Satellite-based characterization of convective growth and glaciation properties in relation to precipitation formation over Central Europe. J. Appl. Meteor. Climatol., 56, 1827–1845. Senf, F., Dietzsch, F., Hünerbein A. and Deneke, H., (2015): Characterization of initiation and growth of selected severe convective storms over Central Europe with MSG-SEVIRI. J. Appl. Meteor. Climatol., 54, p. 207-224. Senf, F., D. Klocke, and M. Brueck (2018), Size-Resolved Evaluation of Simulated Deep Tropical Convection, Mon. Wea. Rev., 146(7), 2161–2182. Wapler, K., Harnisch, F., Pardowitz, T. and Senf, F., (2015): Characterisation and predictability of a strong and a weak forcing severe convective event - a multi-data approach. Meteor. Z., 24, 393-410.